Another year, another batch of funky dark saison, our sixth so far! For this iteration Alex and I decided to go with our lowest OG to date, 1.051. Mixed-fermentation beers often overshoot the alcohol content you'd expect from a similar gravity clean beer because of the high attenuation of Brettanomyces. While ale and lager yeast are only able to ferment carbohydrate chains up to three glucose molecules long (maltotriose), Brett is capable of tackling chains three times that length (aka "unfermentable" dextrins). In doing so it continues to produce alcohol and carbon dioxide long after a standard fermentation ends. For this batch we decided to ferment with slurry from two of the three variants of the Furlough Rye Saison. One appropriately contained dregs from Dark Saison 4, the other had two isolates from the Bootleg Biology's Pithos Blend. Using either yeast slurry or established sour beer is a great source for bugs because it allows you to taste what the microbes have already accomplished. It is like getting a writing sample rather than a transcript; it allows you to personally evaluate each applicant. Alex and I are hoping we get some of the tartness from the DS4 culture, while the Pithos elevates the earthy funk. As for our usual addition of dried fruit, I'm planning to give this batch a bit more time before I decide. Maybe cranberries, I want something bright to help cut through the rich flavors from the raisiny Special B and D180 candi syrup. My half of the last batch, Dark Saison 5, is still sitting on quince paste (membrillo). It already tastes great, I'm just waiting for the temperature in my basement to rise a few degrees so I can be sure fermentation is complete before bottling. 1.00 oz. Horizon (Pellet, 10.00% AA) @ 45 min. Brewed 12/8/13 with Alex and the MT Kickstarter Crew. 4 g of CaCl added to both the carbon filtered mash and sparge water. Otherwise untreated. Collected 11 gallons of 1.045 runnings with a batch sparge. Plus an extra gallon of final runnings. D180 candi syrup added near the start of the boil. Topped off with the final runnings with 15 minutes left in the boil. Chilled to 75 F, shook to aerate, pitched 5 oz each slurry from two versions of Furlough Rye Saison (White Labs Saison III and Saison Blend) with DS4 dregs and Bootleg Biology Pithos Isolates. Very clear wort. Left at 67 F ambient to ferment. 4/30/14 Racked to secondary finally, and added ~15 Hungarian oak cubes from our homemade red wine (Cellar Craft Showcase Red Mountain Cabernet). 10/7/14 Cooked down 2 qrt of cranberries with the zest from two oranges for 25 minutes. Added to the secondary. 4/12/15 Added 2 g of rehydrated Champagne yeast. 1.006, I'll let it warm up for a few days to make sure it really is done. Tastes very nice! 4/16/15 Bottled with 4 1/8 oz of table sugar. Aiming for 2.8 volumes of CO2. When doing mixed fermentations, do you ever look at the interactions of strains on a biochem level? Ie. knowing which phenols and compounds the saccharomyces will put out and how the secondary strains will metabolize it to form "X" flavors or by-products? I'm doing something similar but with a much simpler grain bill, just 96% pilsner and 4% Special B, using 3724 as primary yeast and adding built up bottle dregs from Goose Island Sofie and Matilda. I was waiting for 3724's characteristic slowdown at 1.030 to pitch the built up bottle dregs. So far mini tastings have been pretty promising after a couple of months. Spicier (more phenolic) primary strains tend to result in funkier beers after the Brett is finished. That's the 4VG to 4EG conversion. That also partly explains why 100% Brett are less funky that mixed-fermenations. Sadly there isn't a huge amount of specificity out there beyond that. Just curious about the final runnings addition. Have not heard of that before and wondering what the purpose is? Do you collect that final gallon at the time of your original batch sparge or is it sitting longer in the mash tun during the first hour of boil? What's your process for adding dried fruit? heya mike - i too have a question about "Topped off with the final runnings with 15 minutes left in the boil." any concerns about DMS, given that those final runnings won't have been boiled for very long? or is the amount so small as to not worry about it? Also, building on your answer to my previous question: have you ever tried to pitch a funky strain like WLP650 after a Brett primary, say fermented with Trois or Claussenii? What would you postulate the result to be? With no WLP 585 on the shelves, what would be a good alternative for the blended yeast? More specifically, were there any characteristics of the 585 led you to choose it over similar strains or is the point just more diverse esters, phenolics and such? Thanks for the write up. Eager to read about the results! The kettle was only about 12 gallons, if I'd had more room I would have just added the final runnings earlier. No worries about DMS, with such a small percentage of the volume. 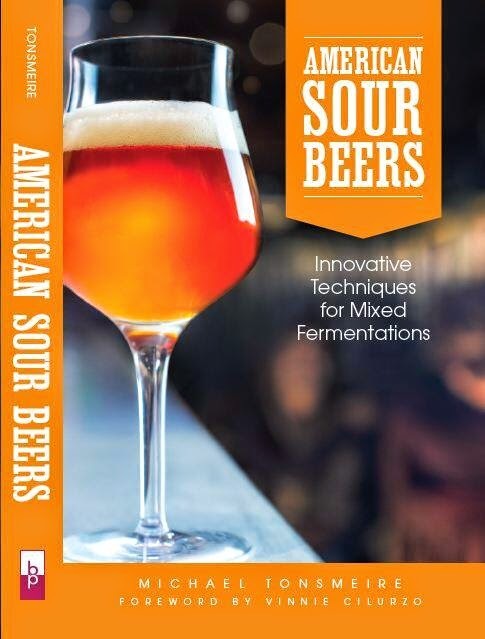 DMS really isn't as big concern in sours, given my experiences with no-boil Berliners. Dried fruit gets a quick rise with dilute Star-San to remove any oil I can get off, then right into the beer. I don't usually wait as long as I would for fresh fruit, I give the dried fruit plenty of time in the beer. Pitching a different Brett strain in secondary after a 100% Brett fermentation wouldn't do anything "special" that I can think of. Wouldn't be much different than pitching them together in a disproportionate blend in primary. By all means give it a try and see if something interesting happens. With Brett in there, I wouldn't worry too much about the details of the primary yeast. Any saison or blend of strains would be fine. Firstly an amazing and truly inspirational blog, it gives me endless hours of reading and ideas floating around in my head. I recently brewed pretty much the same recipe, using a dry saison yeast in primary fermentation. After 3 weeks it was down from 1.058 to 1.008. I split it two ways with 11.5L going into two better bottles & pitched White Labs Belgian sour (it's my first attempt at brewing a sour so i'm not sure what to expect) along with 100g of dried cranberries. Question is how much time do you think it would need on the cranberries? One carboy will also get some oak originally from a bourbon barrel that's been soaking in red wine for some time. Would you just hide the carboys away for a number of months before taking your first sample? Russian River leaves their sours (Supplication and Consecration) on dried fruit for their entire barrel aging duration. While I like quick contact for fresh fruits towards the end of aging, the flavor of dried fruits is far less delicate. I'd leave the cranberries in there until the gravity is stable, and you are ready to bottle. Take a sample in a couple months to see how it is coming along, but no rush! Glad the blog has made you see the funky light! Since you have plenty of experience with this style, I was hoping I could get some advice on how to "fix" a funky dark saison I made for myself. I brewed it last September and added some burnt honey, dried figs caramelized in some of the wort, and fresh sage. I pitched Wyeast 3711 and bottle dregs from about 6 different homebrewed sours. The grain bill was very similar to your Funky Dark Saison #3. Right now it has a pleasant, well-balanced acidity with flavors of tobacco, toffee, and molasses. But it has an astringent aftertaste that borders on unpleasant. That astringent flavor has been present for at least 4 months now. Have you ever encountered this in your dark saisons? Would you recommend any fruits, spices, or spirits that may blend well with what I currently have? Acidity and roast can be a tricky balance. I'm not aware of a great solution. You could blend it at service with a sweeter/fuller beer to alleviate the astringency. You could blend it before bottling, but you'd need to kill all those friendly bugs to prevent them from drying out the beer you are blending in (similar story if you wanted to add maltodextrin). There is a chance that unpleasantness will age out, but at a year old that isn't a strong chance at this stage. Vanilla is a common one for trying to cover unpleasant character. Not sure it'd help this issue though. I was curious as to how you add the viscous/sticky cranberry mixture to your secondary. I'm assuming you just use a funnel and pour/shove it into the carboy? I've always had a hard time getting viscous liquid to go easily inside of the small carboy opening. Wondering if you had a trick up your sleeve. Thanks. A wide-mouth funnel is something I should buy, but for this I just spooned the gloppy mixture into the carboy. It's in a plastic-carboy, so the mouth is considerably wider than an equivalent size plastic carboy as well.